The unprecedented devastation caused by Hurricane Sandy challenges us to be both more grateful for all we have and compassionate, genuinely compassionate, toward those who have suffered life-altering losses. At the same time, a very important election is coming up and it deserves your attention and participation. It’s frustrating that many of us live in solid blue or red states, which means the electoral votes from our states are presumed and we are effectively told that our vote for the presidency doesn’t matter. I live in California and we have not seen any TV ads or visits from the candidates (except short ones to raise money). History has taught us, however, that there are no sure things and our assumption that our vote doesn’t matter might change the outcome if lots of people don’t vote. But whether or not your vote matters in the presidential election, it certainly matters on state and local issues. Here your vote is definitely important, but it’s much harder to make informed decisions. Please take the time to read about the propositions and to learn about the character and positions of local candidates, especially for Congress. The truth is that both presidential candidates have much less power to do the things they say they will do. The constituency of the Congress will be the critical factor in what gets done and what gets held up in gridlock. It’s impossible to know how all the turmoil caused by Sandy will affect the election. You can be certain that voting will be more difficult in some places because of damage or power problems. Lots of people will be so preoccupied with getting their lives together that voting may be the last thing on their minds. If you live in an area affected by the storm, please do everything you can to urge and help folks in your area vote so their voice is not lost. Finally, in my never-ending quest to urge you to take off purely partisan glasses and look at all the initiatives and candidates fairly (by honestly assessing whether they can and will do what they say they will do, and whether doing it is the best thing to do), I direct you to a wonderful, objective and nonpartisan website: VoteSmart.org. This site features a very interesting tool called Vote Easy to help you make informed decisions on the merits of each candidate. Please share your opinions and suggestions with me by writing michaeljosephson@jiethics.org. 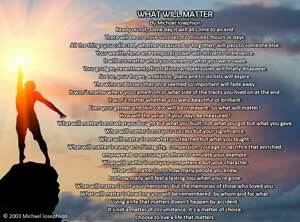 Return to the What Will Matter homepage to see current and archived commentaries, quotes and other good stuff.